A political insider offers a revealing perspective and examines the public and private life of BC’s controversial premier. In the blood-sport arena of provincial politics, BC’s enigmatic premier, Christy Clark, has defied the pundits to win both party leadership and an upset election victory against all odds. Made deputy premier in 2001 shortly after her first foray into public life, she shunned Gordon Campbell’s cabinet solidarity to return to private life in 2004. After a bold run at becoming Vancouver’s mayor, she launched a successful media career as a CKNW talk show host. In 2011, she surrendered that security and entered the Liberal leadership race, shocking the party’s inner circle as she claimed her spot as Campbell’s successor. The campaigner known in her home province simply as Christy has been underestimated by many. Since her surprising usurpation of the BC Liberal Party in 2011 and their stunning re-election in 2013, BC’s first elected female premier has ruffled more than a few feathers; she has also won many new supporters while employing her own unique leadership style. In this revealing look at the woman behind the trademark smile, political insider Judi Tyabji traces Clark’s journey from middle-class roots to her political awakening and rapid rise to power. 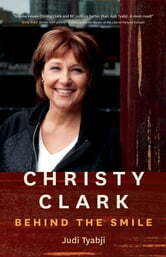 Based on meticulous research and extensive interviews with over thirty public figures and the premier herself, Tyabji’s Christy Clark: Behind the Smile paints an intimate portrait of one of the most influential women in Canadian politics today. Wilmer J. Leon III Ph.D.